Happy Friday dolls! We made it through the end of the week! Yesterday I spent most of the day in St. Pete for a distillery tour for work (if you follow me on Snapchat: PamelaNicole84 you saw my snaps!) so I'm playing catch up today. UCF has an away game this week so I don't get to go out and tailgate this week but after last week's performance that might not be such a bad thing. We're playing Sanford this weekend so I know it's going to be tough but hopefully we've picked up our act a little and will be ready for next weekend. Ok, enough football talk (I know, who am I, right?) let's jump right into my Friday Favorites shall we? 1. I have such an obsession with lipsticks lately, it's almost unhealthy. Ok that might be a slight exaggeration but I really do have a crazy obsession with them. My current obsession is the Frozen Berries collection by Bite. The colors are all so gorgeous and are the perfect transition colors from summer to fall and even winter. I think the Black Cherry and the Elderberry are my favorites. 2. I am absolutely in love with this ring. It's so gorgeous and fun and something I would totally wear every day. I really love it in the Ivory Tokyo color as well my only concern is it might be a bit wide for my skinny little fingers. 3. Thanks to Katie I am obsessed with this jacket. It is so perfect for fall and I love the colors it comes in! 4. I'm already ready for fall clothing and a fall hair color! I'm loving this rich, chocolate brown for the summer to fall transition. A bit darker without being too dark. What do you think? 5. I made this for dinner on Wednesday night and it was delicious! Such a great light, meatless dinner but still very filling! Although let's be real, I love anything with cheese and lemon! Dying over that ring and J. Crew jacket! I've been wanting a cargo type jacket like that for fall. I can't believe you made that for dinner, I do good to heat up chicken and rice! have a great weekend! The hair color, the jacket, the ring...yes yes yes! It rained here last night (something I know you guys are all too familiar with) and this morning there's a chill in the air--so I'm kinda feeling Fall even more now. i am loving the dark, vamp lips. anything berry is calling my name! I loved your Snaps yesterday from the distillery! You have an awesome job!! All of those lipsticks are gorgeous - I can totally see why you are obsessed! Have a fantastic weekend, girlie! I will definitely have to check out those lipsticks, they are so beautiful! I think the hair color would look great on you, it's the perfect fall color! Bite lip colors are the best! Pinning that recipe to try soon. It sounds delicious! Huge fan of bite lipsticks. They have the best colors. I love the dark hair color, I think it would look amazing on you. I too just went darker (last night actually) and love it. All I need now is for the weather to get cooler. Ooooh love that Jcrew jacket for fall! I also LOVE Bite lip products! That collection looks perfect! Loving that hair color ... I've been "pinning" new fall 'do's this week too, I need my hair done so badly! Have a great weekend!! I wish I was brave enough to start wearing lipstick! I don't know why it intimidates me so, but it does! LOVE that color! It would be gorgeous on you! I love that jacket! I'm so into darker fall colors. Haha I want my whole wardrobe to feel moody. Love those lipsticks - I'm really needing a few more fall colors! I'm on the search for a perfect fall jacket and that one looks great! We need that jacket!!! Fingers crossed it goes on sale soon! Loving the hair inspiration, too! Happy Friday! 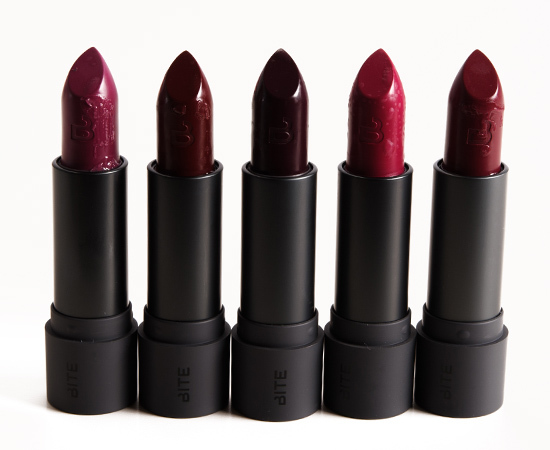 Those lipsticks are gorgeous and perfect for fall! And that jacket! I've been drooling over it too since Katie posted it, perfect for our "winters" here in FL! 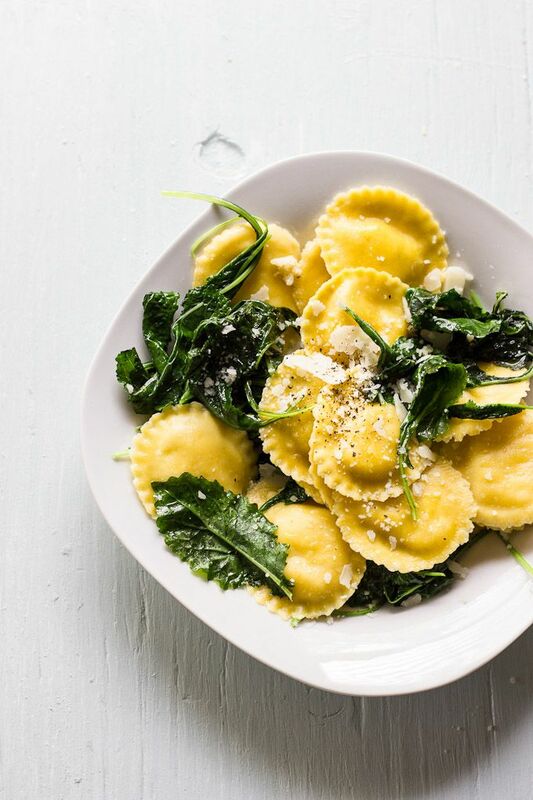 Omg those raviolis look amazing!!! I love cheese and lemon too! That hair color would look amazing on you! So pretty! have a great weekend! Those lipstick colors are fabulous, I haven't tried Bite yet but I have heard great things!!! That jacket is so cute and I love that hair color! A little darker without being too dark would be just perfect. Hope you have a great weekend! love that hair colour - and i mean her hair in general is just gorgeous! i also want that jacket because of Katie lol wonder if they'll put it on like 75% off haha. have a good weekend! I am in love with that hair color! If I wasn't a die-hard blonde for life, that's the kind of brunette I would go for. Love the ring! to bad it isn't in my size :( and the ravioli yum!! Love the colors in that lipstick collection. I'll have to check them out. I'm turning into a lipstick person more and more. The recipe looks delish. Go dark!! I wish I could go that dark so I am going to live vicariously! Yum!! The meal you made looks so delicious! Also loving the hair color you picked. You should do it! I think I need all the lipsticks in that collection! Loving that jacket, too and that hair color would be gorgeous on you! All of those lipsticks are gorgeous but that middle one... LOVE!!!!! I love that hair, too! I say go for it!